Let sit at least 1 hour, and it can easily be made the night before. 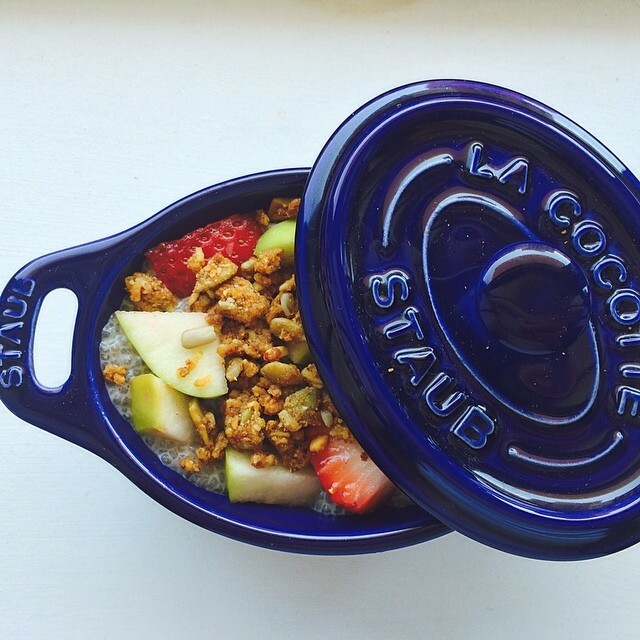 Paleo Krunch is a gluten free product that I use for breakfast or as a snack. 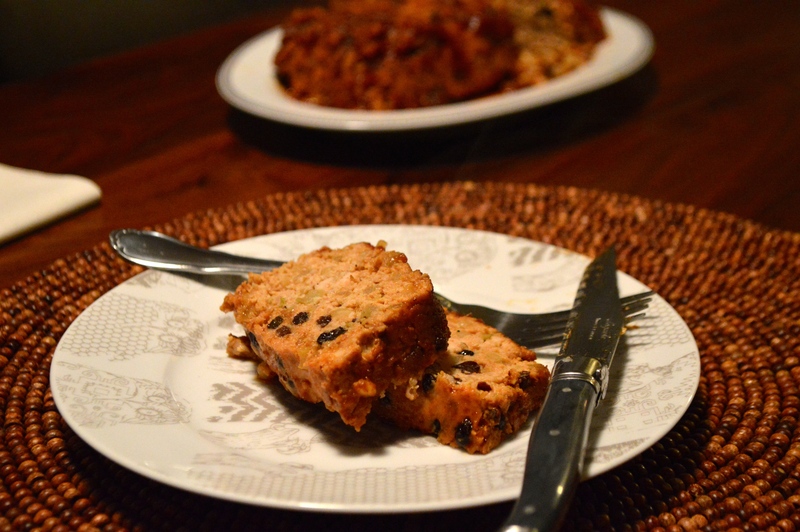 It’s a great alternative and works perfect in this Paleo/Gluten-free/Dairy-free breakfast or dessert dish. A powerful way to start your day or enjoy as I did, post workout. Packed with flavor and with a silky smooth texture. This is one of my favorite ways to get a quick and healthy snack/meal in. 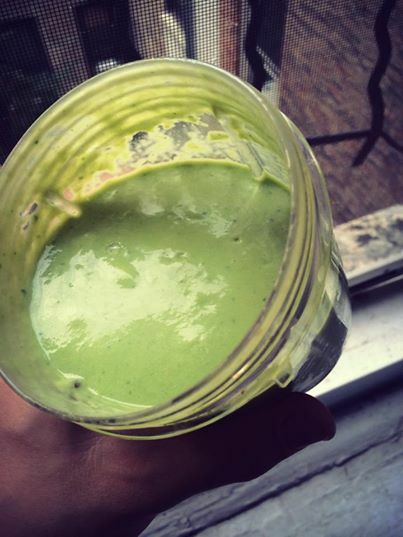 This smoothie is super savory and is great for lunchtime. Blend smooth: I used a Nutribullet and it works beautifully. This smoothie would also be great with the addition of Flax seeds, Nut and Seed butters, Chia Seeds, Nuts, more veggies and also fruits. An ancho chile based sauce, this is the most mild of them all. It’s great as a dipping sauce or used as a marinade. Habanero and Cayenne based sauce, it has a great smokiness and chile flavor. My favorite of the line, it’s the same as the “Warm” sauce but blended with caramelized shallots and garlic. It’s has the richest flavor, in my opinion. This sauce is hot and has so much going on. Jerk seasoning from St. Ann, Jamaica, W.I. as well as scotch bonnet peppers and scallions. It’s a very flavorful sauce. 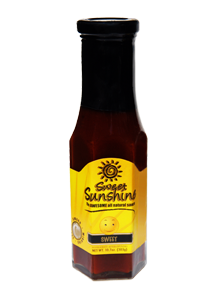 I used it as a marinade for chicken thighs along with honey for added sweetness and it was delicious. So hot it made me sweat. A blend of ancho and Red Savina Habanero chilies. This sauces is FIERY. Perfect for the person in your life that likes the burn! 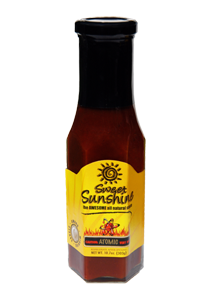 This sauce is crazy hot as it’s name might lead you to believe. 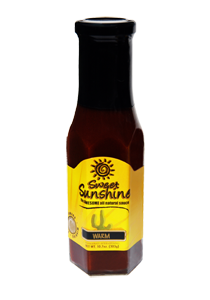 A few drops on top of braised meats or on Tex-mex food is all you need to ignite your mouth. Too intense to cook with in my opinion, this one is for the real pepper-heads out there. I chose my favorite sauce to make a recipe with. 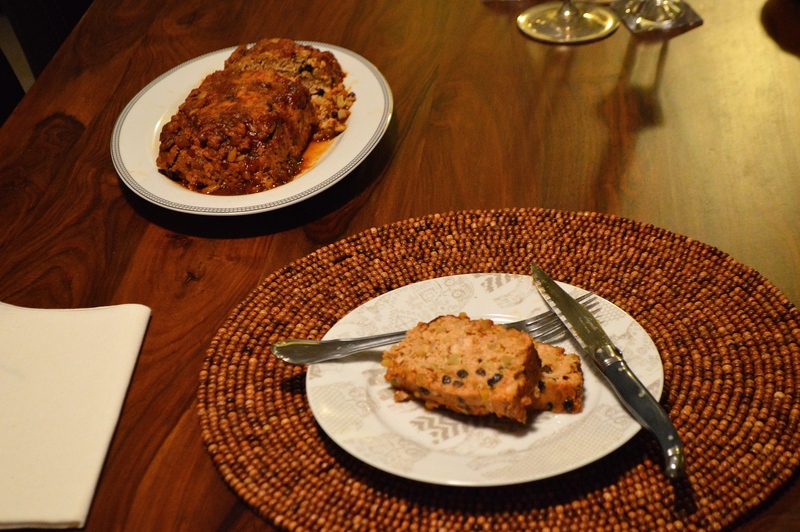 I loved the flavor of the Roasted Shallot & Garlic sauce so I developed this lean- healthy meatloaf recipe. The granny smith apple and currants add sweetness while the pine nuts give some needed fat and flavor. The Sweet Sunshine “Roasted Shallot & Garlic” Sauce shines in this dish and comes through with a great spice level. 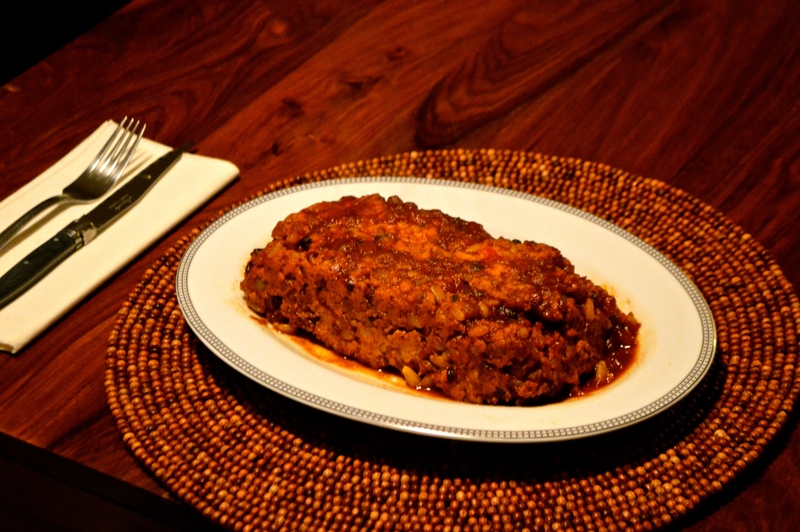 This meatloaf would be perfect over a bed of fresh lettuces or with some cauliflower couscous or sweet potato puree. In a skillet, cook onions until caramelized, add garlic, thyme, and apples. Continue to cook until the apples have begun to caramelize. Remove from heat and allow to cool. Stir in toasted pine nuts and currants. In a bowl mix together egg, 1/2 of the Sweet Sunshine Roasted Shallot & Garlic Sauce, 2 T ketchup, salt & pepper, and almond meal. Mix turkey meat into sauce mixture, when combined add sauteed apple mixture. In bottom of a loaf pan, add the remaining Sweet Sunshine Roasted Shallot & Garlic Sauce and the remaining ketchup, mix to combine. Pack the meatloaf mix on top of the sauce, pat to make sure there’s no air pocket. Bake at 375º for 45 minutes. Insert a knife to make sure that the loaf is cooked all the way through. Allow to cool for 5 minutes and invert. The sauce will be caramelized on top. Allow 5-10 minutes for the meatloaf to redistribute its juices and then you can slice to eat. One 10oz bottle runs for $6.99. It really is a great product and different kind of condiment for sandwiches, wraps, marinades for different proteins, dips, and burgers. You should definitely check it out, because it is #ChefApproved. I have recently cut gluten and dairy out of my everyday diet and am on a mission to improve my overall health and wellness. In changing my diet, I have had to teach myself to do things that I I’ve always known I needed to do but ignored with my busy schedule. Time is the one thing we all never have enough of, so I have begun to plan my meals out a week in advance and make things that will work for multiple meals. 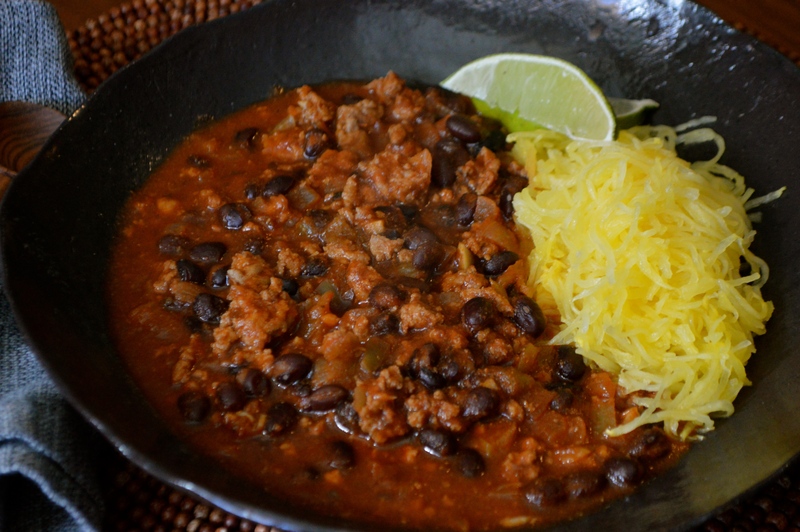 Any kind of meat chili is a great meal, high in protein, satisfying and hearty, as well as low fat. When you make your own you can control the levels of salt and fat that are added to it. I also love making chili because it’s something that you can throw together, put on a timer, and walk away. This recipe would also work great in a slow cooker. In a large heavy bottom pot, add 1 T of olive oil. Saute onion, garlic, and peppers on medium high heat until softened. Add ground turkey and break up meat with a wooden spoon. Continue cooking until turkey is cooked through. Add your McCormick spices, stir to combine and cook for several minutes to open up spices. Add dark beer and cook until beer reduces by half. Add chipotle sauce and crushed tomatoes, stir to combine. Cover with lid and let cook on low heat for 30-45 minutes. Taste chili and adjust with salt and pepper as needed. 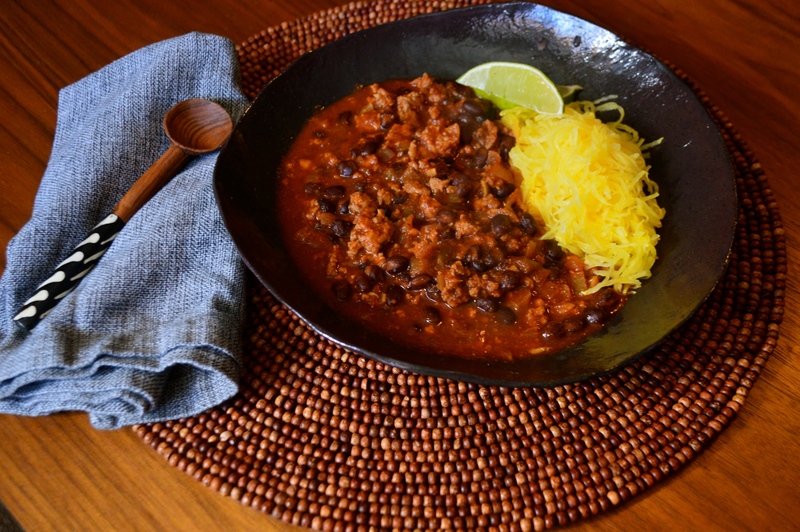 The chili should be thick, spicy, have a good heat, and slight bitterness from the beer. If you like it slightly sweet, you can add 1 T brown sugar when you add the tomatoes. 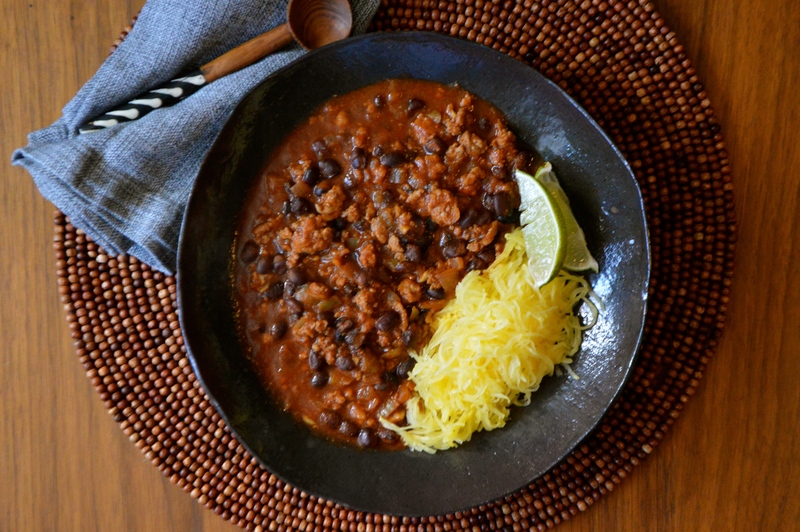 Take a spaghetti squash and cut it in half long ways. Use a spoon to remove all seeds from the squash. Place both pieces on a sheet pan and add some water to the bottom of the pan to create a moist cooking environment. Season both with salt and pepper. Remove and use a fork to scrape the long strands of squash from the peel. You can eat it just like spaghetti, saute it or mix with a sauce. If you have really large ones, you will need to cook longer. Cheers and enjoy this healthy and delicious recipe!